WHAT IS LOCAL HARVEST NYC? 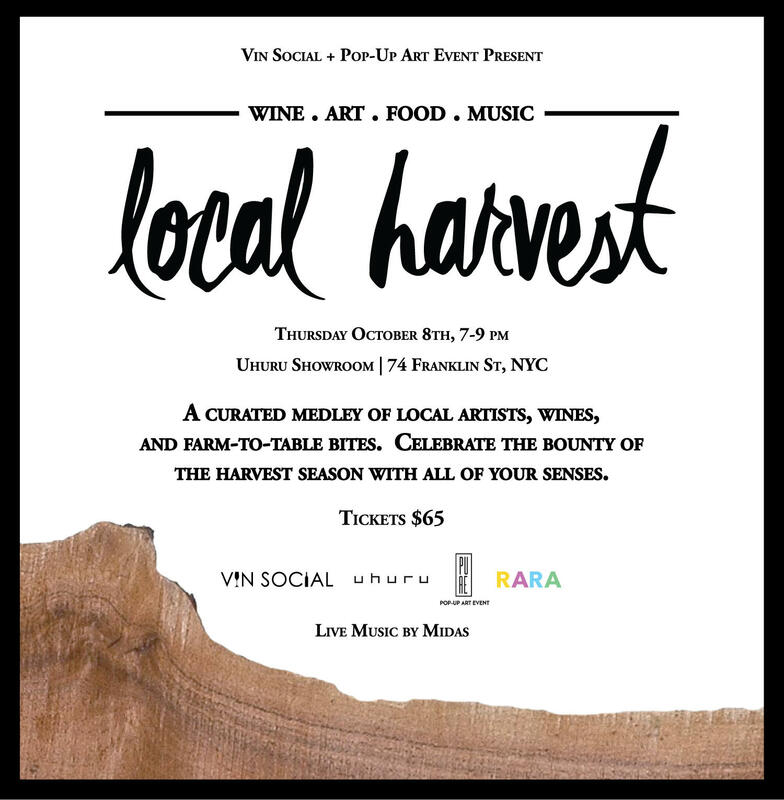 Local Harvest NYC is a collaboration of creative thinkers, makers, and curators. come together for a one-of-a-kind feast for the senses. And you're invited to take part in the experience. Local Harvest is a collaboration of creative thinkers, doers, and curators. for a one-of-a-kind feast for the senses. Clear your schedule. This is going to be epic! ﻿VIN SOCIAL is a wine-centric events company with a mission to make wine accessible and approachable to those thirsty for knowledge and a bit of wine savvy. We share our passion for the juice through highly curated experiences featuring honest, sustainably produced wine made by passionate, authentic people. The Pop-Up Art Event team partners with artists and cultural entities in curious spaces to create site specific immersive experiences. Conceived by collaboration enthusiast, Juliet Silva Yee. Photo by Rachel Barrett of RARA. RARA is a culinary concept company with an emphasis on health, community integration and food justice. We believe in the full cycle of food as a connection to our lives and to each other, our farmers and collaborators and the people we share our creations with through our curated events, art and magazine. ﻿Uhuru Design is a Brooklyn-based design and build furniture company known for its reuse of used materials and focus on sustainability. The recently opened Uhuru Showroom in Tribeca will serve as the venue for the event.